MEN’S FOOTWEAR TOOK A STEP IN THE RIGHT DIRECTION during Fashion Week, thanks to the outstanding footwear collection from Brave GentleMan. 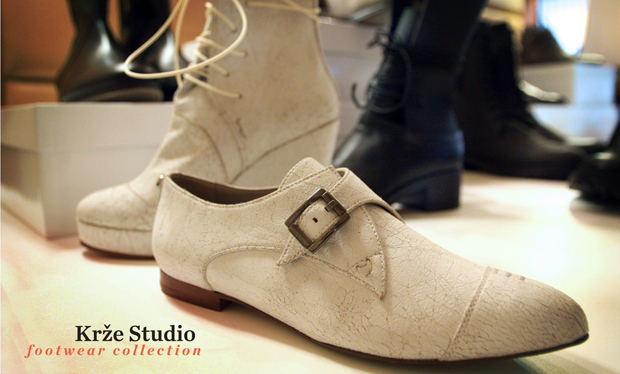 Worn by the models during VAUTE’s Autumn/Winter ‘13 Presentation, the shoes were immediately eye-catching, tying each look together crisply. There was an impressive range of boots, oxfords and saddle shoes in sophisticated hues, each offering a new take on classic silhouettes. Demonstrating a high degree of craftsmanship, design and versatility, the line of footwear also gave men of style something to feel good about: the collection was entirely vegan, sustainable and made under fair labor conditions. 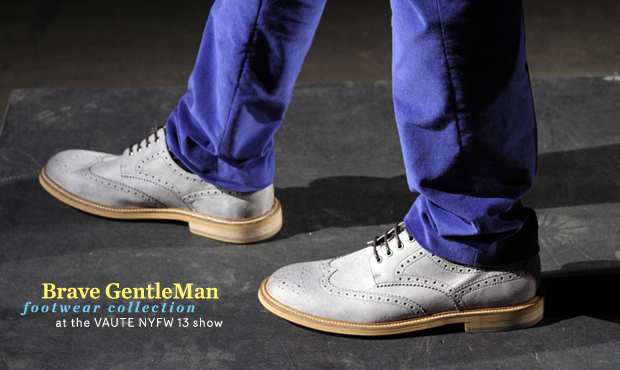 If shoes make the man, these undoubtedly would make you an even better one. “Ecologically, they are far superior to traditional leather in that they were not tanned in a chemical bath, they are naturally water-resistant, and they are not products of the livestock industry which has a staggering effect on water resources, topsoil erosion, GHG emissions, and grain and petrol consumption,” Joshua Katcher, the designer behind the line, explained to us when we visited him in his studio last week. The line is a collaboration with another vegan brand of footwear, Novacas, and is constructed in Portugal from Italian textiles. 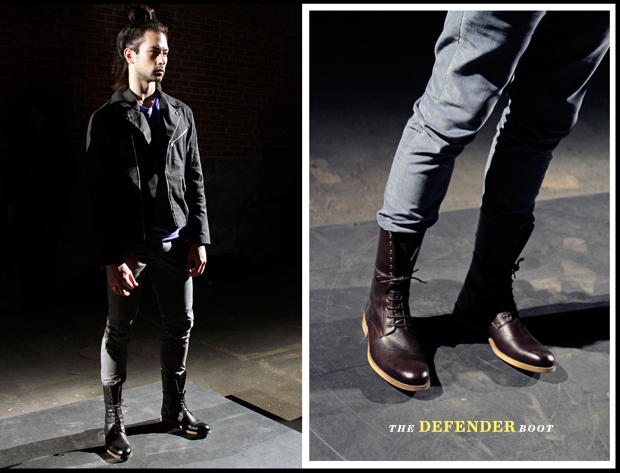 One of our favorite styles from Fashion Week was the Defender (seen above)— a twelve-eyelet bulcher-style boot. The bulcher were introduced by the Prussian General von Blücher, Joshua explained to us, and are “known for having side pieces that lap over the front and vamp,” he added. The upper is a biodegradable PU microfiber. It is remarkably indistinguishable from leather in look and feel. And this is where the Italian craftsmanship element comes into play. The material is made up of “millions of tiny fibers that, like an animal’s skin, feel supple and can handle wear and tear very well,” Joshua told us. This level of detail results in shoes that are breathable, that break-in naturally, that don’t crack, and are resilient. Seeing the gorgeous line within the context of a vegan fashion show was undoubtedly one of the week’s highlights for us. Joshua— a long-time vegan— has been utilizing fashion as a vital extension of his work as an activist for a number of years. “The fashion industrial complex not only affects millions of people’s livelihoods globally and is tied to some of the worst environmental problems like livestock (sheep, cows, pigs), but it is one of the most powerful forms of creating values and meaning based on aesthetics and expressing personal identity,” he told us. “Fashion is so culturally relevant and has global implications on issues of humans rights, animal rights, and the environment,” he added. With wool production being just one example of an environmentally detrimental practice, not to mention cruel— companies like Brave GentleMan are leading the way towards making these practices obsolete. Joshua is currently designing his Fall ‘13 and Spring ‘14 collections, and we have a hopeful hunch that a Fashion Week presentation is in his very near future. 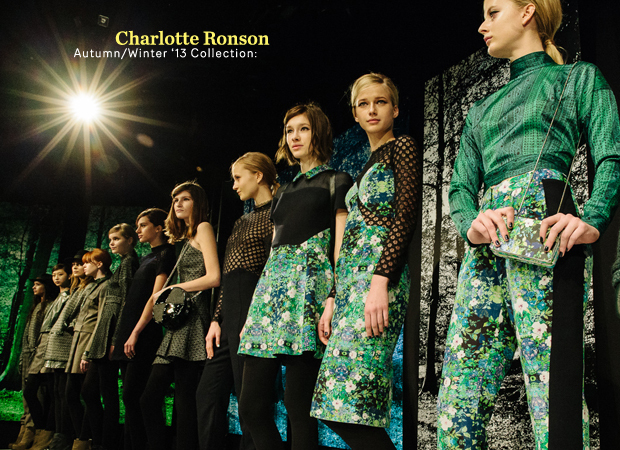 We also got to check out Charlotte Ronson’s Autumn/Winter 2013 Collection. 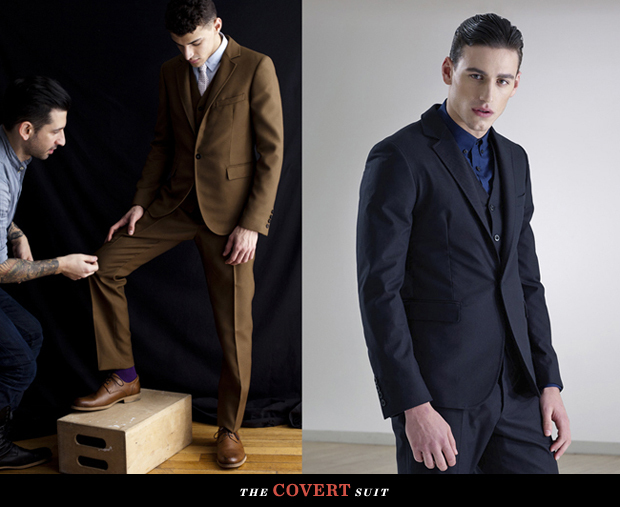 Showing 60’s Mod influences, the collection boldly integrated spring-time floral patterns into a fall wardrobe. There were flirty halter dresses and A-line minis in lively emerald greens, punctuated by blacks; touches of peek-a-boo mesh panels; eclectic color-blocking and unexpected cutouts. While we must make clear that Charlotte’s collection is not all vegan, we are reporting on it here because she has publicly asserted herself as a fur-free designer. 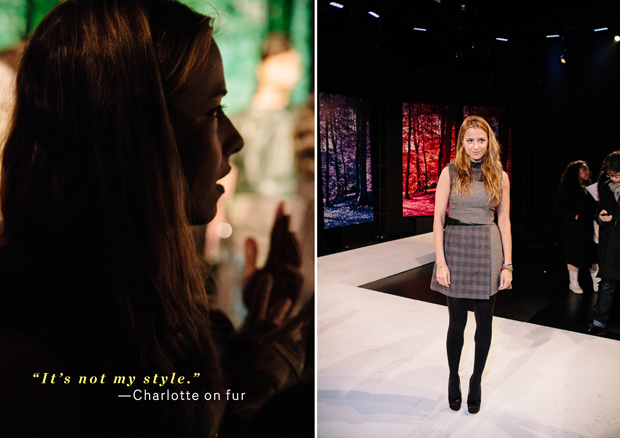 During a time when some designers have taken to accepting bribes veiled as sponsorships from a fur industry desperate for market share, Charlotte has remained steadfast in rejecting the usage of fur in any of her garments. Indeed, even just by virtue of excluding fur, she is setting a heart-felt example for her peers. “It’s something I can do, and it’s something that could make a difference,” she told us, when we spoke to her after the show. She recalled being invited to the offices of the Humane Society a few years ago, where during a meeting she saw videos about the harsh realities of the fur trade. She was deeply affected. “You just can’t go back,” she said. She further explained that fur as a fabric simply doesn’t appeal to her, and is not only “not my style,” as she put it— but that she doesn’t wear it or use it in her collections for compassionate reasons. “I’m against any kind of animal cruelty, and I love my little dog,” she told us. Another highlight during Fashion Week was seeing cruelty-free and vegan cosmetics being used. 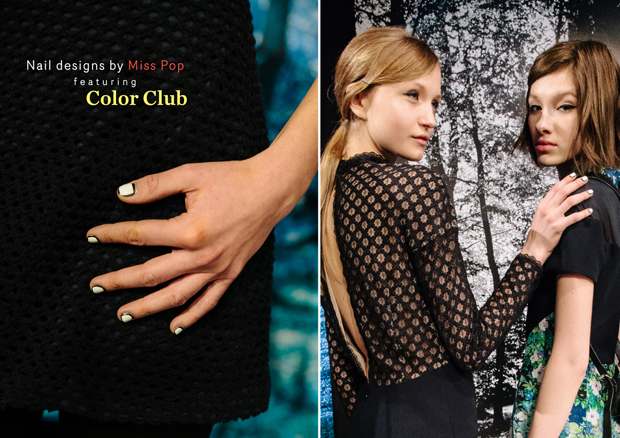 Simcha Whitehill, aka Miss Pop (a nail artist with a cruelty-free kit, and a contributor at Laika), created several stunning nail designs for the runways, partnering exclusively with the outspokenly cruelty-free and vegan Color Club nail lacquer. For Charlotte Ronson, she created the “Picture Frame” look (seen above). “To match all the hues in the collection we did five permutations of the look: lipstick red and eggplant, hunter green and a bright purple, two shades of grey, sand and a deep ocean blue, and black and white,” Simcha told us. The look above can be easily recreated at home, using Color Club’s Where’s the Soiree and French Tip shades. Start by applying one coat of the darker shade of polish, and then imagine your nail is just a teensy bit smaller and polish your nail using the lighter color. “This should leave a thin U shape of the darker color framing your nail,” Simcha explained. Brush on a thin French tip with the lighter shade to complete the nail frame. Another design from Simcha was this nature-inspired look, which used a custom color she created with Color Club called Raw Amber. 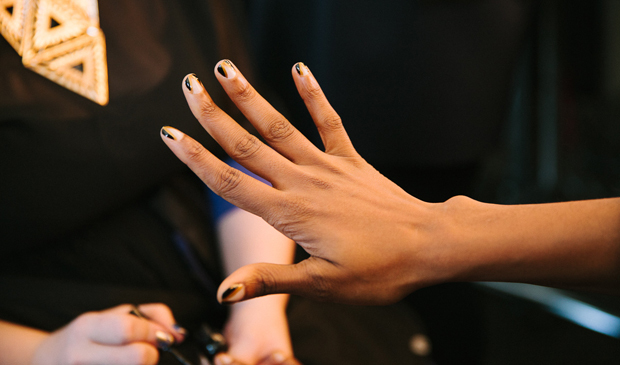 The look integrated the natural nail peeking through as part of the design. And the purpose of the geometric shape was to evoke “an element of mystery- the openness of the natural nail shrouded in amber and black,” Simcha explained. That week, we also made a trip to mid-town Manhattan to check out the footwear industry’s version of Fashion Week— the New York Shoe Expo, a major trade show from the Fashion Footwear Association of New York (FFaNY). There, we discovered an exciting new vegan collection from Krže Studio. The collection was in large part inspired by founder and designer Leila Kerze’s home base of Los Angeles. “There is a play between art and industry, motorcycle culture and the canyons and beaches it races through. Though the collection exudes an aggressive and rugged strength, it finishes in elegance,” Leila explained to us. Many of the designs have aerodynamic silhouettes, with lacing and chain detailing. The collection shown in NYC is expected to hit retail outlets in July or August of 2013. While compassion was Leila’s primary motivation for starting Krže Studio (“I do not believe it is possible to create something truly beautiful if its origins are from suffering, cruelty, and victimization,” she told us), she quickly discovered that many of the vegan materials on the market not only rivaled the look of leather, but were actually superior in performance and function. The lining of her shoes, for example, utilizes a breathable, anti-bacterial and porous material that is approved by the American Podiatry Association. “This means that both a tall winter boot and a strappy spring sandal can be worn without becoming uncomfortable because of bacteria,” Leila explained. With many vegan leathers being plastic-based and recyclable, designers now have an opportunity “to adhere to a cradle to cradle philosophy and make a renewable and sustainable luxury product,” she added. Indeed, what we saw during Fashion Week is that not only is it possible to create cohesive and imaginative clothing and footwear without the use of animal fibers— but one can create a collection that in fact surpasses conventional materials in style and function. So perhaps today’s designers should ask themselves the question, Am I moving forward with the currents of change and progress, or swimming against them, regressing further into stagnant practices? If fashion is about innovation and rebellion, it seems evident that humankind has in fact fully exhausted all the possible ways to use animal skins. It is time we give some serious thought to the price animals pay for our vanity, and carefully examine other viable solutions. For a designer like Joshua Katcher— who is already successfully implementing these solutions, you can’t put a price on compassion. “No one complains that furs or leathers are “too expensive”, but most designers are desperate to use that visual currency. But if you asked them to pay workers fairly or invest in new textile technologies that remove animals from the production model, suddenly it’s “too expensive.” Deciding to work towards an ethical fashion system doesn’t have to be an aesthetic choice. If you’re a good designer, you should be able to make brilliant work with whatever materials and production methodologies are available,” he says. We look forward to the day when being a good designer becomes universally synonymous with being an ethical and compassionate one. And we feel confident that this day will come. Brave GentleMan photographs courtesy of Joshua Katcher, Gregory Vaughan and Anthony Two Moons (respectively).